Legendary musician Greg Sheehan has long been regarded as one of the finest percussionists in Australia, yet ‘percussionist’ doesn’t’ really do justice to the kind of musician he really is. A pioneer of contemporary rhythm in Australia and with his propensity for experimentation & exploration on all sorts of instruments – tuned and un-tuned, man-made and earth-made, he is firmly in the realm of Australia’s great musical innovators. The Life Of My Time is Greg's debut solo album, it is a rhythm-magician’s adventure through world rhythms, textures and unusual beats – a colour of sound the likes of which has never been heard before. As well as unique rhythms the album also showcases a battery of unusual instruments, such as the Hang, a memerising bell-like instrument from Switzerland, Jaws Harps from Vietnam crafted from recycled war materials, Bike Horns, Kids toys, Balloons, Kitchen Utensils…This combined with more traditional percussion instruments and Greg’s incomparable tambourine creates an unforgettable experience. “The Life Of My Time” is truly a voyage of awesome musical landscapes and eclectic rhythm, coloured by Greg’s passion for exploring rhythm around the world. 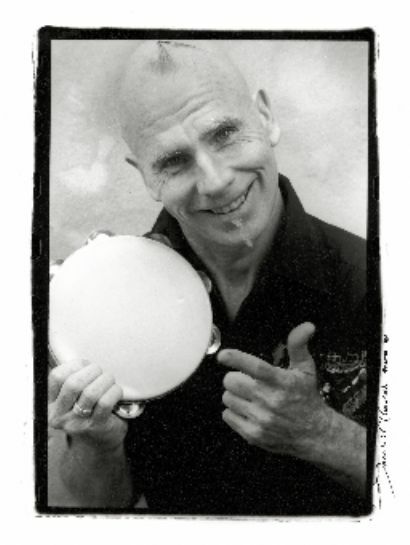 Master drummer, Greg Sheehan, performs wild drum rhythms on more than 10 different drums from around the globe.